When my father-in-law was a teenager he built a boat in his basement. He spent the whole winter working on it. When Spring came and he was ready to hoist that boat out of the depths of his house, his teenage mind had not thought through the logistics of getting a full size sailboat up a narrow L shaped stairwell that was the only exit from the basement. This is the boat story that my husband grew up with. He heard it over and over again as a kid... and as you might have guessed it planted a seed in his teenage brain too. 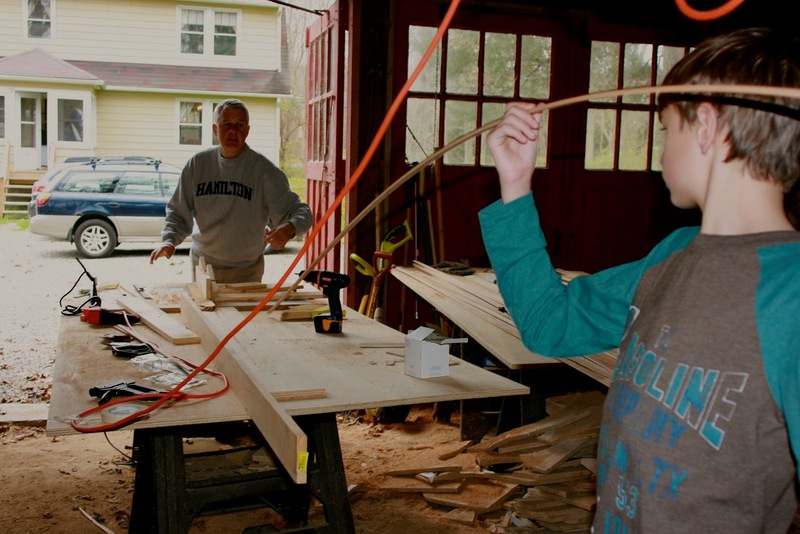 He decided he wanted to build a wood strip canoe, but he grew up in Florida and didn't have a basement. It wasn't until now, with a teenage boy of his own, that he has started to build his dream boat. Learning from his father's mistake he is constructing it in the garage not the basement. Fortunately for my husband we have a master carpenter of a nephew who helped create the strong back to hold the form of the boat in which he is attaching the wood strips. My daughter helping her cousin build the strong back. When I asked my husband why he is building a canoe he said, "Why not?" 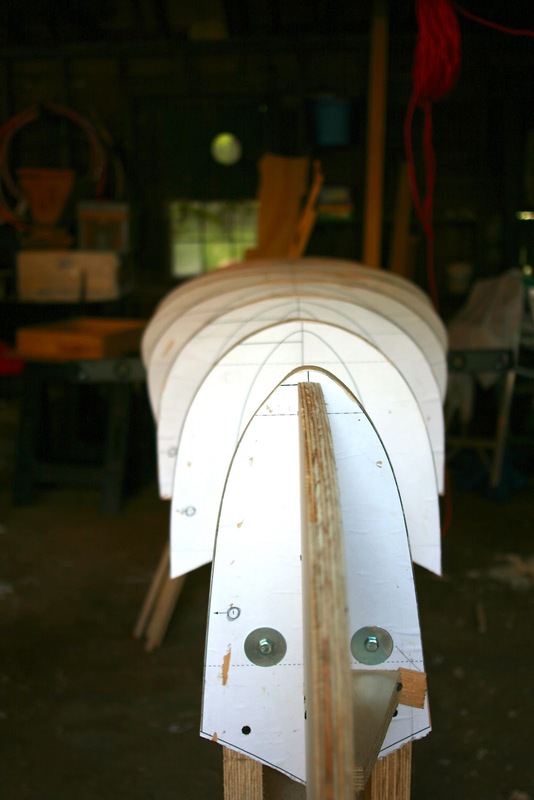 He has always admired their beauty and how light weight a wood strip canoe is in comparison to a regular canvas canoe. Let me tell you, once you have had a few mile long carries canoeing you appreciate a light weight boat. 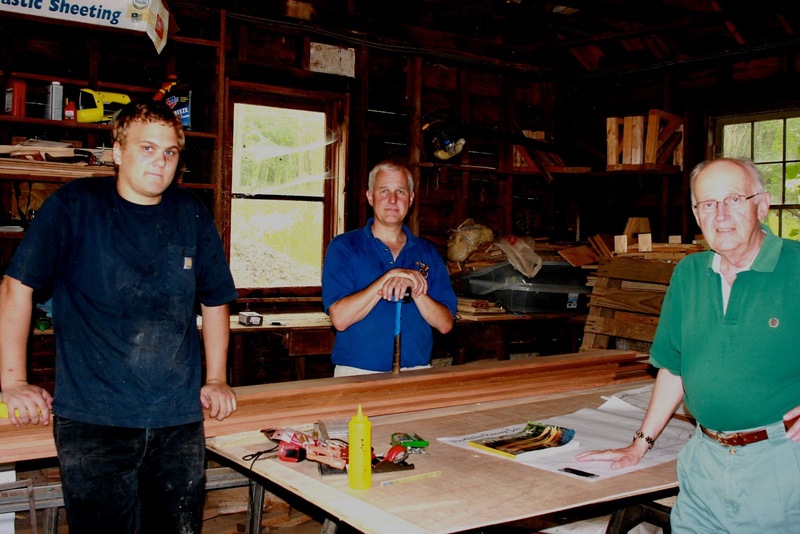 Father and son striping the wood. So this is my husband's Simple Living project, I invite you to think about what you have always wanted to build. A friend of mine's husband built a cuckoo clock over one winter, and another friend carved miniature civil war soldiers by hand and created a battle scene. Whatever your dream... turn of the TV and engross yourself in a creative project. Who knows maybe someone else in your family might get interested too? Quality time together... that's always a good thing. Whether or not anyone joins you in the project it will make you feel more fulfilled and relieve more stress in your life, than a video game or yet another reality show. Simple Living Idea: How to Stay Motivated? Currently working on my Cedar Strip Canoe! Please share pics when its done. I love wooden canoes! Oh wow - this is truly amazing! They will certainly have some fond memories of building the boat together. Can't wait to see the finished product. You are so right Suzy... everything my husband gets into this boat he will take those memories of building with him. I love it Diane! Have they finished the boat yet? Not yet, what you see in the last picture is as far as they have gotten. Because they are working with glue the temperature has to stay above 50 degrees. We are having a bit of a cold spell which has put the project on hold. I think your husband and mine would hit it off! He has made his own cedar strip canoe. It was very rewarding. It will be a prized possession for sure! What wonderful inspiration for generations to come and how nice for it to be a family project all together. What an accomplishment this will be!! Thank you for sharing on Motivation Monday!